Handheld Pressurized Steam Cleaner and Sanitizer / Powerful Multi-purpose Steamer, Removes Stains, Grease, Mold, etc. and Disinfects / Removes Wrinkles from Garments This is not a bulky steamer on wheels. It’s a completely portable and can be held in one hand! Use it for all your quick cleaning jobs. 1. Fill the reservoir with water 2. Plug in and heat the water 3. Attach the extension and steam clean away! Clean Easily, Safely and Efficiency The Miracle Steam lifts stains, dirt and bacteria from nearly any surface! Is something caked onto your kitchen floor? Food stains on your couch? Grime build-up on a fixture? No more worries! The Miracle Steam makes swift work of all these unsightly blemishes. Tiring scrubbing is in the past. Using the Miracle Steamer is as easy as 1,2,3! All you need is clean water in the tank, and your pressure steamer is ready to use in minutes. Versatile Portability The Miracle Steam Cleaner comes with accessories, multiple nozzle lengths, cloth sleeve, brush plate, cleaning brushes, and door & window attachments. Each of the Miracle Steamer’s components are made for convenient, thorough cleaning. Each of the attachments as well as the unit itself are lightweight and portable for easy use. Use for surrounding areas of your kitchen sink. Easily steam away old grime around the sink basin caulking. Those hard to reach crevices around the dishwasher? Easy! Those ultimate grease stains around and in your oven or stove? in seconds, the heat breaks away the grease and you can wipe it clean! The unit is not hot when handling to clean so there is no need to wear gloves to protect from heat. Next stop; the bathroom for all those toilet stains sink, shower stall and tub. 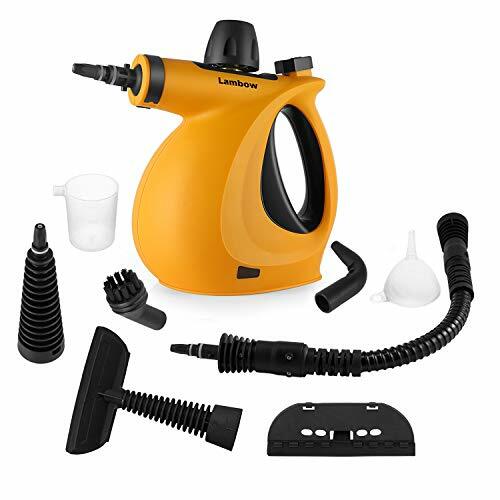 【Fast Warm Up and Strong Cleaning】With 900~1050w power and max 250ml water tank volume,heats quickly 1 to 3-minute,this cleaner emits pressurized powerful hot steam (338 °F / 170°C), easy to cut through any grease, mold, grout or stain, perfect for domestic cleaning. 【Chemical Free】Our steam cleaner is 100% Chemical free with no harmful fumes or residue. Includes a safety lock on the handle and a safety cap for added peace of mind for your safety! Avoid using harmful chemicals cleaning counter tops, floors, table, kids toys, washroom, toilet, bathroom, carpet, window, pet box & more. 【Portable and Easy to Hold】 Lightweight and convenient handheld design makes it easy to carry from room to room. Convenient 6.5 ft. power cord enables to maneuver efficiently and to easily clean hard to reach areas. Features a safety auto shut-off protection that shuts the steamer when the water level gets too low or when the unit becomes too hot. 【Multi Surface Use】180℃ Rotate Nozzle Design,for better use and more convenient to remove dirty corners.Includes 9 pieces special accessories allow you to clean virtually every surface,including sealed surfaces sinks, stoves, counter tops, refrigerators, kitchen, floor, living room, BBQ, kids toy, mattresses, linen, duvet cover, fabric & Sofa Material, pants, suits, clothing & fabrics. 【Package and Shipping】Pack of 1 Funnel,1 Long Spray Cup,1 Bent Spray Cup,1 Measuring Cup,1 Terrycloth Cover,1 Spray Cup for Door/Window,1 Extended Connecting Spray,1 Spray Cup with Round Brush,1 Window Washing Squeegee per parcel.Shipping within US usually takes about 4-7 days. Kindly Note:Do not face people to avoid burns. View More In Steam Cleaners, Steam Mops & Accessories. If you have any questions about this product by ShamBo, contact us by completing and submitting the form below. If you are looking for a specif part number, please include it with your message.